Our nation has asserted a commitment to providing educational opportunity for all Americans regardless of race, ethnic background, or economic circumstance. In support of this commitment, Congress established a series of programs to help low-income Americans enter college, graduate and move on to participate more fully in America's economic and social life. These Programs are funded under Title IV of the Higher Education Act of 1965 and are referred to as the TRiO Programs (initially with three programs, hence TRiO). 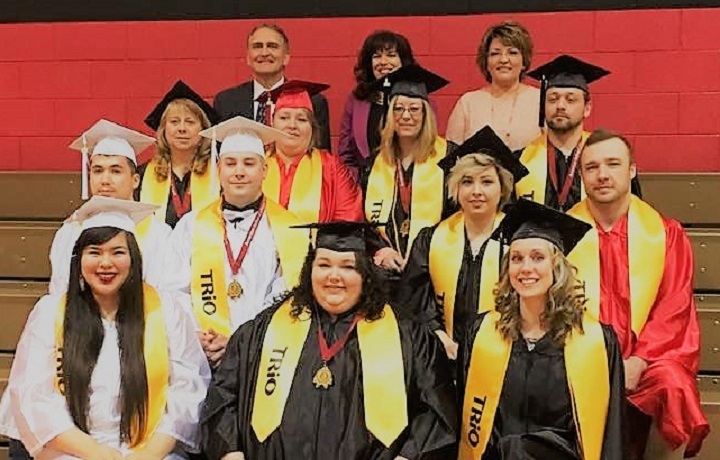 While student financial aid programs help students overcome financial barriers to higher education, TRiO programs help students overcome class, social and cultural barriers to higher education. Student Support Services (SSS) is a program that offers services aimed at increasing the academic potential of SSS participants and are provided at no cost to eligible students. The goal of the program is to increase retention and graduation rates of college students who demonstrate academic need and who are either first-generation, income eligible, and/or have a documented disability. This goal is based upon the belief that all students, regardless of age, family background, learning style, or presence of a disability, should have equal opportunity to reach their full personal, academic, and career potential. · Have a documented disability. Program information and applications are available in the SSS office, located in the Administration building TRiO offices #140-142. Potential participants must complete necessary paperwork to be considered for acceptance. Once the paperwork is complete and submitted to the TRiO/SSS department, a staff member will be in contact with you regarding program acceptance. The Student Support Services program provides opportunities for academic development, assist students with basic college requirements, and to motivate students toward the successful completion of their postsecondary education. Student Support Services (SSS) projects also may provide grant aid to current SSS participants who are receiving Federal Pell Grants. The goal of SSS is to increase the college retention and graduation rates of its participants (U.S. Department of Education). Education Opportunity Association (EOA) is the representative body of those persons who have an active interest or who are professionally involved in broadening accessibility to and success in formal postsecondary education. This includes many colleges, universities, and agencies that host educational opportunity programs, including TRiO programs, within the ten states in the Midwest. Formally known as MAEOPP. The Council for Opportunity in Education (COE) is a non-profit organization that is dedicated to expanding college opportunities for low-income, first-generation students, veterans and students with disabilities by working collaboratively with colleges, universities, and agencies that host TRiO Programs. The U. S. Education Department’s mission is to promote student achievement and preparation for global competitiveness by fostering educational excellence and ensuring equal access.